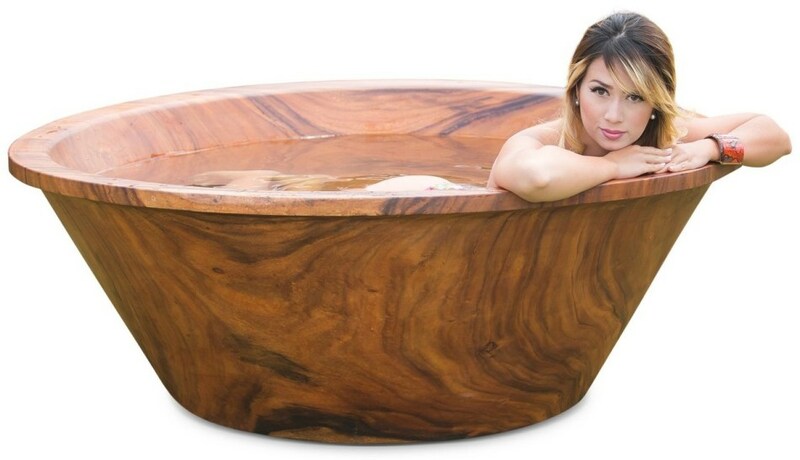 Is it possible to make a solid wood bathtub out of a single 3000-kilogram (6600lbs) mass of wood, that didn't contain glue or epoxy? More importantly, can this be done in a sustainable manner? The general consensus is you can't even make a kitchen cabinet out of solid wood let alone a nearly 6-feet diameter bathtub. There was a concern, "will it hold water?" In this case, it was a literal metaphor. Woodworkers insisted it would crack from uneven drying, and architects just shrugged it off as "impossible" as the wood would be too unstable and move and twist and be as one architect stated, "a hopeless mess." Dugout canoes, it was pointed out, contain many cracks and issues, yet the thought of making a dugout seems very daunting in this day and age. "Most architects have very limited training in wood," explained Jonathan Kitzen, sustainable wood expert and one of the original founders at Timber Neutral (www.timberneutral.com), the company that oversaw the sustainability issues. There are more than 2,000 commercial tree species in the world and each one has different mechanical and aesthetic qualities. In the past, the company consulted on a 2.4m (8-ft) by 25m (80-ft) hardwood slab from a single tree, which at under 100 years old was one-quarter the age of many mature European hardwood trees. "Just because it's big doesn't mean its old," commented Kitzen. "In fact, if you think about it you can cut one single big fast growing tree or 300 to 500 slow growing temperate ones to equal the same mass, which is more sustainable? Which is better for the environment? Cut down an acre or a single tree? And this is not a 3000-year-old softwood sequoia, we are talking huge fast-growing hardwood tree." The tubs are made from trees that are less than 75 years old, sourced from a supplier in Colombia, or about the same age as most mature oak, or beach trees you might find in your yard but far more massive. They were also replanted under the Timber Neutral planting scheme, which replaces sustainable timbers with replanted endangered species. "There is no point in replanting a maple, for example, as they grow like weeds; we need to rethink sustainability and replant those in need," explained Roberts. Timber Neutral offers timber audits to manufacturers to allow them to take control of sustainability and not rely on someone else's chain of custody, because as Roberts pointed out, "Certified does not mean replanted; most people do not realize that." "The goal was to make a 100% natural object and a reflection of the organic nature of wood and true to the spirit of the tree," said company spokeswoman Fiona French of Timber Neutral. "The client was very happy with the result and appreciated that we replanted scores of endangered trees in the area we took the single tree down in."